Student organizers, Bella Wells-Fried, 10th, and Kaiya Nilsson, 9th, led Odyssey 4th-12th grade students and area schools Hangar Hall and French Broad Academy, in a march from campus to Pack Square on Friday, April 20th. 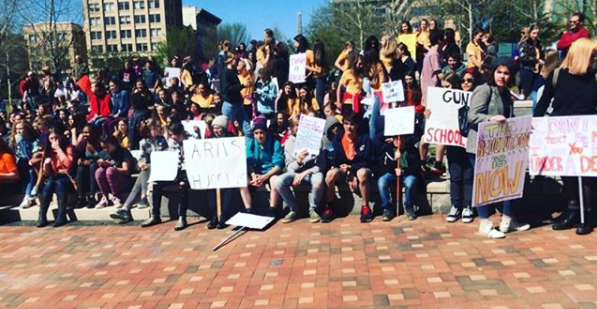 There they met with students from Asheville High, Asheville Middle, and Carolina Day School to gather in a peaceful protest for gun law reform. When presented with the request to participate in this nationwide walk out, faculty and administration guided students through this learning experience in civic engagement. Students learned how to acquire permits for protest, wrote and distributed press releases, researched legislation, researched and brainstormed messaging for protest signs, and prepared for public speaking. They also sent a representative to our faculty meeting to receive feedback about how younger students, parents, and teachers will experience this day – incorporating empathy into the design-thinking process. One student’s Independent Research Project on the history of protest music this past fall prepared him well for his contribution that day. Odyssey’s administration and faculty also spent class and meeting time preparing students to explore their viewpoints from multiple perspectives and aimed to create a safe space for differences in values and beliefs. Students who chose not to protest worked on studying legislation that inspired them and other strategies of civic engagement in democracy.